If three of anything equals a collection, I have a lot of collections. Collecting is an adventure. On any given day, you never know what you will find. My favorite finds are usually my least expensive ones. When I find something rare or even semi-rare and get it for a song, I really, really LOVE it. It's more memorable and much more enjoyable than paying a hefty price on ebay or at an antiques shop. Needless to say, everything I want can't always be found "for a song" at a garage sale or consignment store and plenty of times I have purchased "must have" items at full price on ebay or at antique shops. One of my favorite collections contains both newer items and vintage items. I love this collection because I love Otis Pete, our pug. 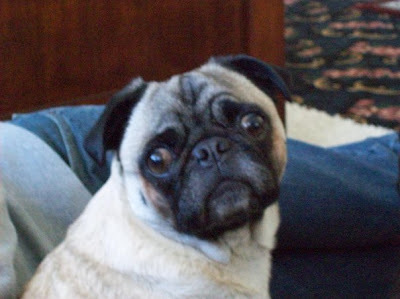 In June of 2004, we acquired the cutest little fawn pug you ever did see. Now at 7 1/2 years old, he's a little gray, and not so cute, but soooooo loveable. He is seven and a half years old now and not as cute but the BEST dog anyone could ask for. In honor of Otis Pete (as my youngest daughter named him), I have acquired some pug memorabilia. A needlepoint pug on a cushion pillow. 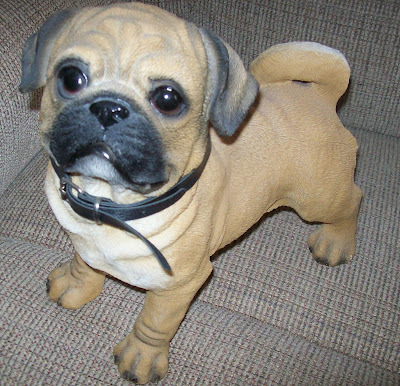 A larger resin pug figurine my mom gave me. Small ceramic group of three pugs. Pug on left purchased on ebay. A Th. Poncelet design tapestry pillow from England designer-cushions.com. Two more ebay pug figurines. The one on the left is marked made in England. My big beautiful ebay ceramic vintage pug. This collection will grow as I find just the right pug items to keep! Thanks for the smile. Your collection is almost as cute as your pug. Carlene, Otis Pete is still adorable! Love all your pug things and especially the cute tapestry pillow. Thanks for linking to the Open House party and Happy New Years. So sorry about your pugs. The only thing I can say I dislike at all about pugs is the shedding. I have a black pug, Scarlet, who will be 7 in February...before her, I didn't understand what the big fuss about pugs was all about. I wanted a bulldog, but my husband wanted a pug. Now, I'm hooked to these little people in fur suits. I love old, gray pugs - they just have the sweetest faces. Scarlet has very little gray - I had expected her to gray around age 3, but she has just a touch on her tail and chin. I actually have a "pug" board on my pinterest page. Sadly, she's staying with my parents, as my 2 year old loves to torment...I miss her so much, so I eat up all the pug love I can find. Thanks for sharing this great post! Otis started to gray in the muzzle around three. We have to watch what he eats or he would really get fat. He loves food! Loving the English one on your mantle. 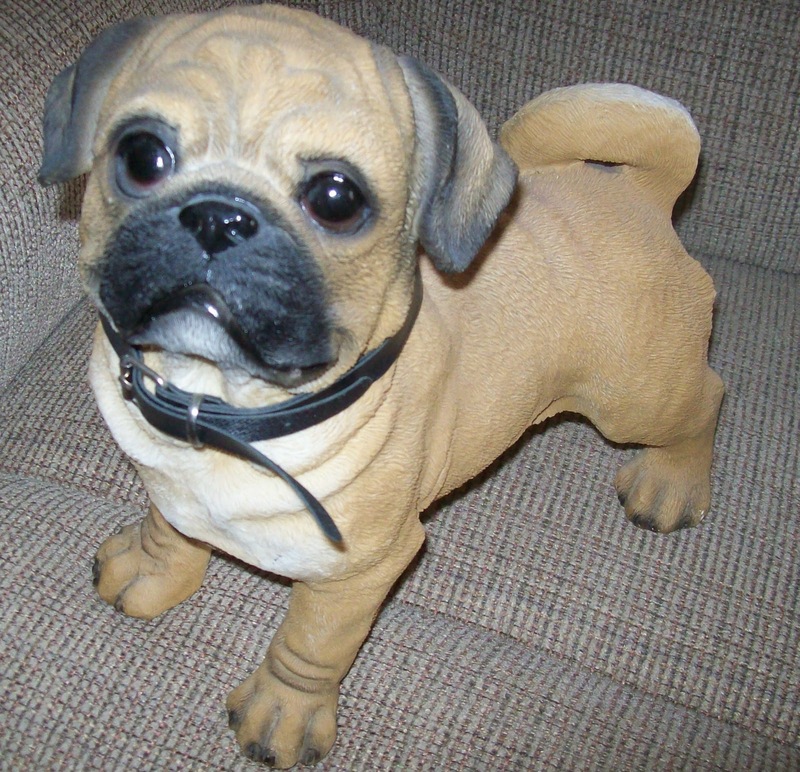 I would have bought that one and I don't even have a pug! Thanks so much for posting and linking up. I truly appreciate it! Oh I just adore, adore pugs! Our pug Ben died in 2010, he was 13 and he was old, the greatest dog ever! He looked so much like your Otis, I love your memorabilia, I have a painting! Happy New Year 2012. Oh he is still a doll! You have started a very nice collection-love those beautiful pillows.I have a huge dog collection-I will share a few later this week. Thanks all of you for your nice comments about our Otis and the pug collection. Can't wait to see your dog collection, Mississippi Artist. OH I do love this collection! We have two pugs in our home...aren't they such a great breed? Your Otis is too cute! Pugs are the best (except for shedding). Cute; so darn cute! Love those pug pillows too. Happy 2012! I love the pillows too. Always looking for more. Thanks for your comments!